Born Gerald Alexander Abrahams on 14th April 1929, Gerry Anderson used his unique imagination, perseverance and resolve to realise his dreams, giving us some of the most wonderful programmes in the history of children's TV and making world-wide household names of many shows including Thunderbirds, Supercar, Captain Scarlet, Joe90, Space 1999, UFO, Four Feather Falls, Stingray and Fireball XL5, to name but a few. His productions have also been responsible for many ingenious innovations, widely used since, in the world of cinematography and marionation. I finally had the pleasure of meeting him and some of his original production staff on Saturday 18th April 1992 during his national 'Thunderbirds' tour and I would like to say that not only was he a creative genius, a gentleman with genuine time for his fans and an extremely entertaining narrator, but also a helluva nice guy! In early 2010 Gerry was diagnosed as suffering from Alzheimer's disease and turned his attentions to promoting awareness of this extremely debilitating condition. His son, Jamie, announced that he had died peacefully in his sleep on Wednesday 26th December, 2012, aged 83, only 3 days after UFO star Dolores Mantez also died, following a short illness. I have found that many sites give conflicting information, even Gerry's official biography! The following production history is, as far as I can ascertain from a fair bit of research, fairly accurate. If you are aware of any documented omissions or inaccuracies, please e-mail me. Linked programme guides are the creation of other authors - please visit their main sites, which are listed on my Links page, for further and more specific information. In most cases, where no direct link is indicated on a particular production, further information may be found on the excellent Fanderson site also listed in my links. For anything to do with Thunderbirds I cannot recommend highly enough 'The Complete Book of Thunderbirds' by Chris Bentley (Carlton Books ISBN 1-84222-092-6) - every Anderson fan should have a copy! 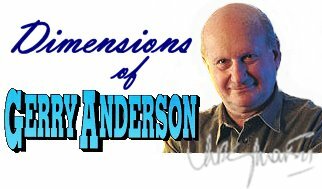 In 1946 Gerry Anderson began as an Assistant Editor at Gainsborough Studios where he worked on 'Caravan', 'Jassy' and 'Snowbound'. to become AP Films, (Anderson Provis Films) with Arthur Provis and some old Polytechnic colleagues.